Der Mann and I left town for a long weekend in Oregon. In the car I suddenly realized that, not counting obligatory family visits, this was our first vacation in about two years. (Maybe I shouldn’t count the two-years-ago vacation, since we were location scouting for Der Mann’s last job hunt. Which means our last vacation was . . . ?) Anyway, after 8 years of marriage it has finally dawned on us that we are not very good at vacations. It’s not that we are workaholics or anything like that. It’s just, we are never quite able to get past the knowledge that even as we are spending mucho $$ on gas, state park yurts, campsites, and hotel rooms; hauling a rice cooker and an ice chest around, we are at the very same time spending $23 a night on perfectly good lodgings with a stove, groceries, and our own bed. Which stands vacant while we load coins into showers and stop to organize the dirty dishes in the back of our minivan. This awareness seems to counteract the happy-go-lucky spirit of a vacation, which I’ve been told is a thing many people find relaxing. This vacation worked out better because we stayed in a cabin on a farm. A second-career farm couple has opened their 40 acres to visitors. 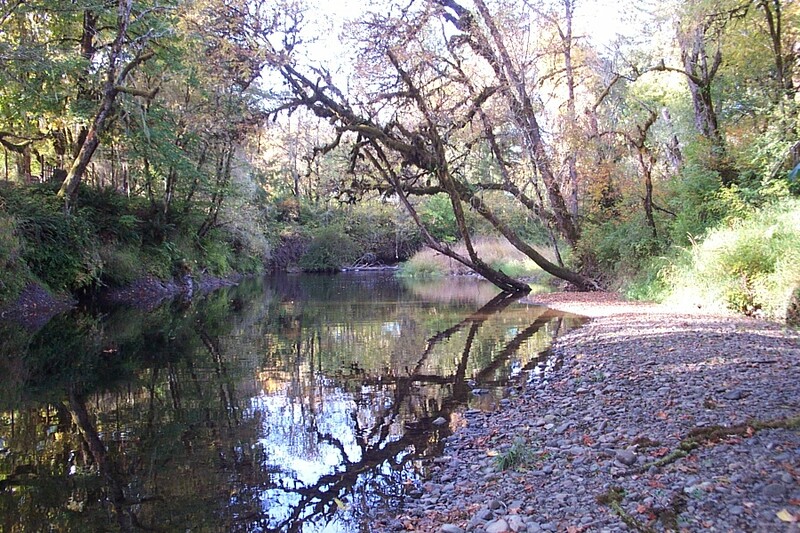 It’s nestled into a cranny between forested hills off the Alsea Valley, which is about at the halfway point when you cross the Coastal Range from the Willamette Valley to the ocean. 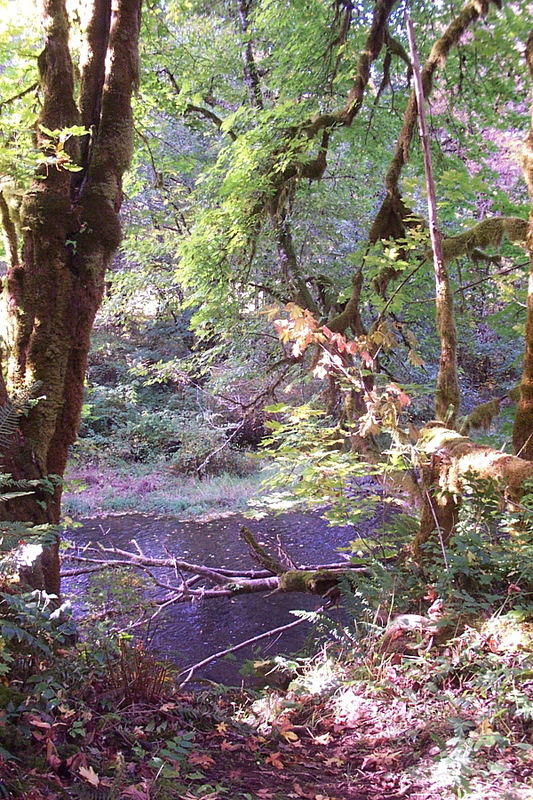 We ended up there because we’d been through the Alsea Valley a few years ago, and thought it was one of the most beautiful places we’d seen. 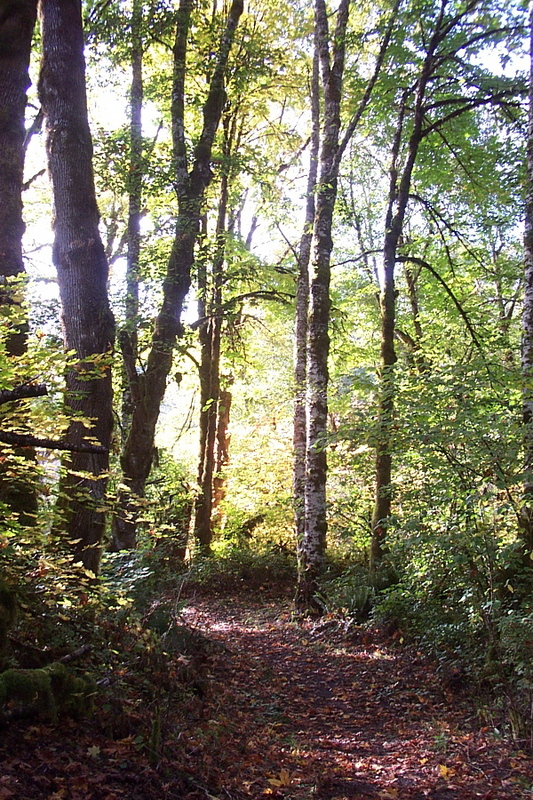 Here are pictures from a walk we took at the county park just outside the town of Alsea. There were a lot of spawning salmon. The owners of Leaping Lamb Farm keep 30 to 40 hair sheep, which they sell for grass-fed lamb. In the barn there are HUGE bags of wool, left over from the wool sheep they have pretty much phased out. Apparently they can’t get enough money for the wool to justify hauling it away. (“Make me an offer!” S told me when she found out I weave.) There are also all the other animals you’d expect: horses, a burro, chickens, geese, a peacock, dogs and cats. 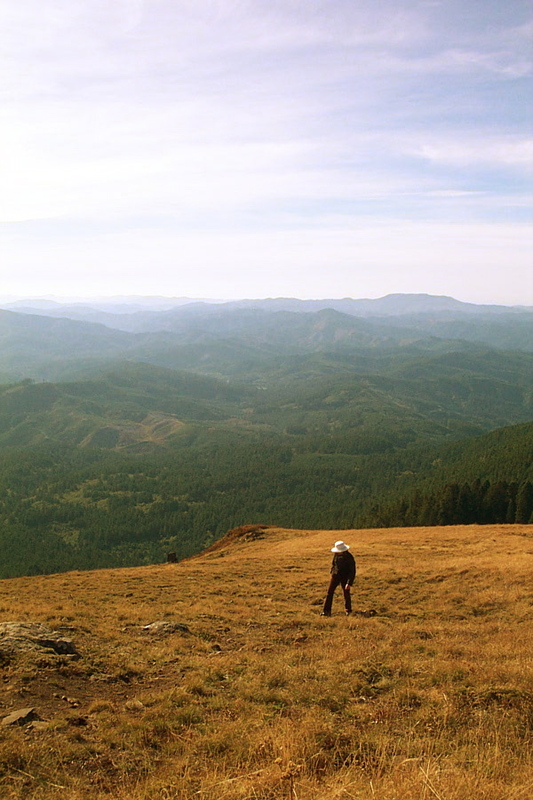 S takes you around to do the chores if you want to, and is a friendly font of information on all subjects farmy and rural Oregon-y. Her generosity comes of having learned everything the hard way herself, since she and her husband bought the drippy 125-year-old farm straight out of southwestern suburbia 5 years ago. The guest cabin was a big, fully finished kit cabin decorated with Pendleton blankets and southwest-style woven rugs. The floors were wide pine boards. It was very nice to hang around there. No itchy bedspreads or pictures you want to turn to the wall. The best part was the full kitchen. The only housekeeping stuff we had to bring was food. I looked at the Pendleton woolen things a lot. I’ve been on tours of both the mills (Washougal is better), but I didn’t think much about the products. By gosh, those are some excellent blankets. I’d like to furnish my linen closet with a few, when I have a linen closet, because I can’t see myself ever weaving anything that wide and fine or felting anything that thickly. I had the disorienting experience of staring at a Pendleton pillow that I would have once seen as simply a pillow, and thinking, “That’s a broken twill.” Weaving does things you. Like, it makes you take a big side trip on the way home, even though that means you’ll face 1 1/2 hours of Portland rush hour traffic. You’d think there’d be a weaving store in Portland, but nope. Woodland Woolworks is tucked away by some grain elevators in the middle of a small town called Carlton. Past Hillsboro, sort of by Newberg. I was there for the warping reels. Since they carry almost every kind, I was hoping they would have some on display. I wanted to get a sense of which were well or poorly constructed, weight, finish, collapability etc. Unfortunately Woodland Woolworks doesn’t keep any reels on hand, just orders them as needed. I wasn’t too disappointed because I was soon in a yarn and book frenzy. The yarn store where we used to live carried a few odds and ends of weaving and spinning stuff, but there is a world of difference between that, and a place with cones lined up on all the walls, and shelves with most of the weaving books I’ve heard of. The weaving room is one of three retail areas. You have to walk through their packing room and office to get from one area to another. Downstairs were knitting yarn, roving, and spindles. Upstairs there were spinning wheels and accessories as well as weaving stuff. And out on the enclosed loading dock? Discounted knitting yarn and second-hand supplies of all sorts! I was circumspect. Now I kind of regret it. If only I’d known about this place when I was looking for a rigid heddle loom or an 8-dent reed! Der Mann went downtown for coffee while I raced from room to room, figuring out what was where so I could budget my dwindling 2 hours. I started out with the books. It is soooo much easier to tell if you want a weaving book or not when you can leaf through it. You can tell a lot just by the sorts of pictures and drafts a book has, how many, and the amount (and tone) of the text. I wrote down the titles of the books I’d like to own so I can order them when I’m ready to part with the cash. Another cone struck my fancy because it is exactly the color of unbleached linen. There are a lot of hideous beiges. You can never tell what you’re going to get with beige. I think I’ll make some mock two-tone linen towels. I also bought some lovely line linen. They have very little Bockens in stock, just two small cubbies, but they did have a blue 16/2 I really liked. The upshot is, I’ll have to go back. There were a ton of different cellulose fibers, chinese silk (loved the silk noil, particularly! 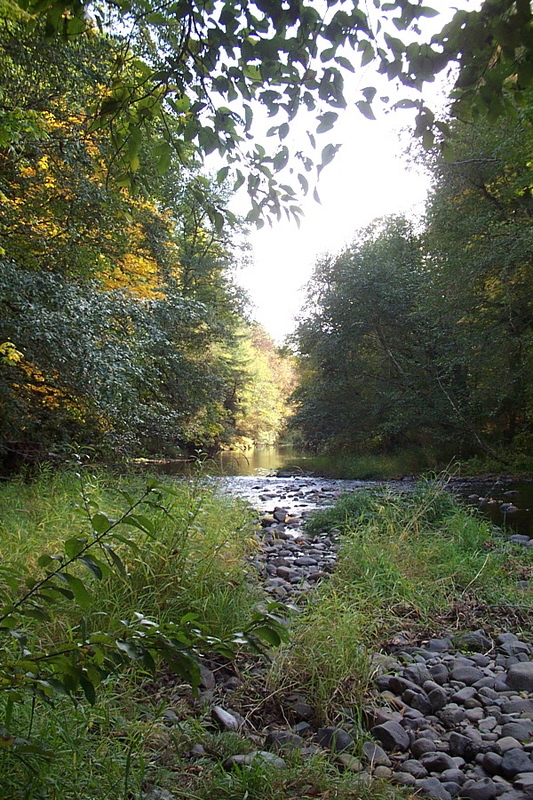 ), and Jaegerspun. Zephyr is on my wish list, and since it’s pricey I’d much rather not order it blind. Also, a HUGE selection of UKI mercerized, if I ever go that direction. And yet something was very wrong with this loom! It opened wonderfully big sheds compared to my Bergman, but I started wondering if they had got the wrong treadle assembly on it, because I got absolutely NO good from those sheds; they were trapped behind the beater! That is to say, when I pushed the hanging beater back–even when it was hanging from the forward-most notch–it hit the shafts immediately. There was almost no space between the fell and the beater. I could barely squeeze the little Schacht shuttle through. I pushed back he jack box, which slides freely on top of the castle, but that didn’t help because the treadles still pulled the bottoms of the shafts way forward. Basically, adjusting the position of the jack box just put the shafts on a slant. I fiddled with where the fell line was, but you need it within about 2″ of the center point of the beater’s arc, or the reed doesn’t hit it squarely. I couldn’t see any way to adjust this Glimåkra that would give more room for the shuttle. True, I only spent about 20 minutes with it, but I had been expecting better things. I was also kind of surprised at the coarse grain and coarse final sanding of the wood. Without its stage makeup, the Ideal just looked big and rough. I expect there is a lot difference between the weaving experience on the Glimåkra Ideal, which is designed for compactness, and the Standard. And of course there is a lot of difference between fiddling with a loom in a weaving store and owning one. Still, I was able to leave with the pleasant feeling that, “Hey, I have a pretty good loom! Warts and all, I wouldn’t trade it for a big lunk like that.” That doesn’t mean I wouldn’t like a bigger, better Scandinavian countermarche than the Ideal in addition to the Bergman some far-off day, but for a compact countermarche I doubt I could have done better. My loom is almost as deep as the Ideal, for all it is so much smaller. I’ve been outpaced. One of the ladies who has come to my blog for information about setting up her Bergman loom is already at the stage of crawling around under her loom (for 2 days!) trying to figure out the tie-up. This is no joke with a Bergman! There is is a bracing cross-bar with a sharp edge (on mine at least) about six inches off the floor, between the back of the loom and the lamms. You have to sit parallel to it, twist sideways, and lean over it when you’re doing anything with lamms. And you can’t sit up straight under your warp. So: duck, twist, reach! My heart and back muscles go out to you, Deborah. 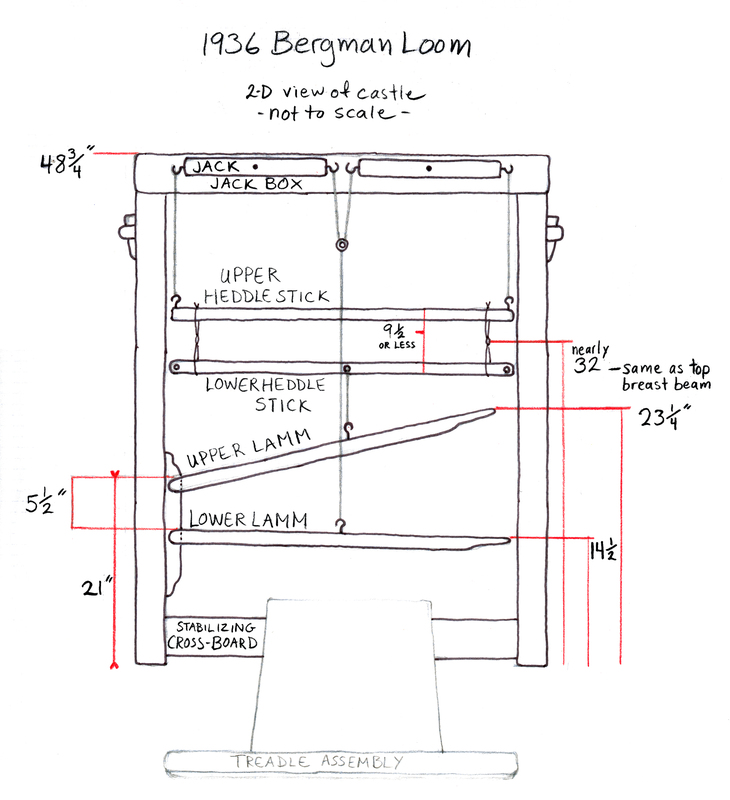 Deborah’s Bergman loom has a very interesting history, and she has a very interesting history. Fortunately for us she’s started a blog, here. She’s been up against a lot, since her loom was shipped from overseas years ago and was in the “Can this bundle of sticks possibly be a working loom?” category for quite a while. It’s missing a back beam, so she’s tied a temporary one on in order to do her tie-up, which seems to me the essence of weaverliness! Deborah asked some questions in the comments section of my post, Warping My Bergman with Mrs. S-G. In the course of this general overview I’ll try to answer them. First important point: You need a real warp on your loom. At least 4 inches wide. Wider, if you want to be able to evaluate your sheds, because it’s impossible to assess bad sheds when you can just hand your shuttle from one side of your warp to the other. That’s why I did the warping post first. You can try out your cord and your knots and learn the mechanics of your loom without a warp, but you need a tensionable warp to get a feel for how your lamms and shafts are going to behave when they’re hooked up to your treadles, how that affects your sheds, and to start making adjustments. My first Bergman warp was a 4-shaft twill band. Second important point: Not all Bergman looms are the same. Mine is one of the early ones, from the 30’s. Later the Bergmans made a change in the placement of the lamms to improve the function of their looms. The document “Getting Acquainted With Your Bergman Loom,” which I’m adding as a separate page (look to the side and you’ll find it), pertains to the tie-up of the later-style looms, as it dates from 1969. I know this because I tried following these instructions exactly, but they didn’t work because my loom doesn’t have the same measurements as the looms the instructions were written for. I’ve made a diagram to show you the lamm slant that has worked best for me after trial and error. If your lamms are set the same distance from the floor and the same distance apart as mine, you will find this a good starting place. Third important point: Don’t be afraid to fiddle with your tie-up. As you start weaving see how things go and make adjustments. If you are using a traditional cord tie-up, this means that the cords suspending the shafts, lower lamm wires, and upper lamms will be loops, therefore doubled. You can make fine adjustments by giving the knotted end of loop an extra twist around the cup hook on either end of the jack. In most places these doubled cords will be attached to the loom with a simple Lark’s Head knot, which will also admit a little adjustment by twisting. Just a Texsolv loop over a single slack cord connecting the inner jacks. It didn’t work at all! For some reason (partly because Texsolv is bumpy), it was necessary that the cord replacing the wire NOT have the possibility of back and forth play indicated by the arrows, in order to have each of the pair of jacks do their fair share in evenly lifting and lowering. The rings should be strong, because a lot of pressure will be put on them. Mine are plastic rings from the drapery section of the fabric store, meant for Roman blinds. I chose the smaller size (just shy of 1/2″) because I could picture the larger size stretching out into ovals. These have worked fine so far. The only thing you need to remember when you are replacing the inner-jack-to-lower-lamm wires with cord, is that the cord has to be thin enough to slip between the shafts without causing them to pack together and produce friction. Your shafts will always hang with the center of the eyes of the heddles at the same height as the top of your breast beam. If you’ve suspended them at this height, and they still hang too low, the only correction you can make is to get (or tie) shorter heddles. Mine are 9.5 inches long, and I kind of wish I’d tried out some that were even shorter. Most of the time my loom works best when the top of the tips of the upper lams are 23 1/4 inches off the floor. 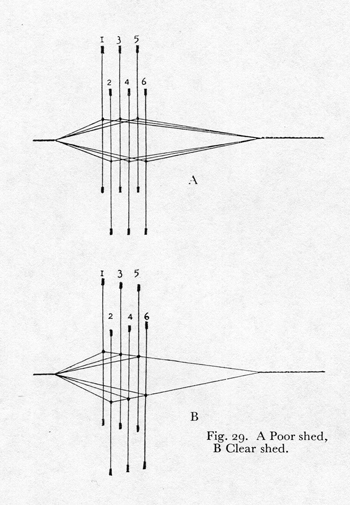 In theory, the lower lamms are are suspended parallel to the floor. In practice, mine tilt down a hair. The top of the tips my treadles are 6 1/4 inches off the floor, which means I can’t use a piece of lumber to keep the height and tension even when I’m tying the lamm-to-treadle cords, as described in the “Getting Acquainted With Your Bergman Loom” instructions. It’s a good trick if you’re treadles work okay for you when they’re that low. I’ve learned to eye-ball mine instead. The big, big, thing about all this is that ALL your shafts, ALL your upper lamms, ALL your lower lamms, and all your treadles are exactly the same height. I haven’t been able to achieve this military precision with Texsolv, as I described earlier in the Texsolv post. Maybe that’s why Athena hasn’t yet blessed me with perfect sheds. I think the idea is that once you’ve achieved military precision, and your sheds still aren’t even, you can tell where you need to make adjustments. It’s all about making adjustments! For instance, I like to tie my left hand treadles up a little tighter getting gradually looser as I go to the right. It’s too complicated to describe why I do this mechanically (It has to do with the way the lamms behave), but I discovered my preference as I wove. 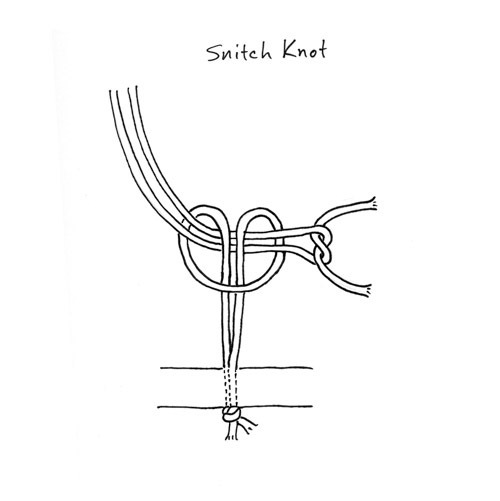 It’s hard to tie a snitch knot if your treadle loops are too short, so watch out for that if you are making them from scratch. 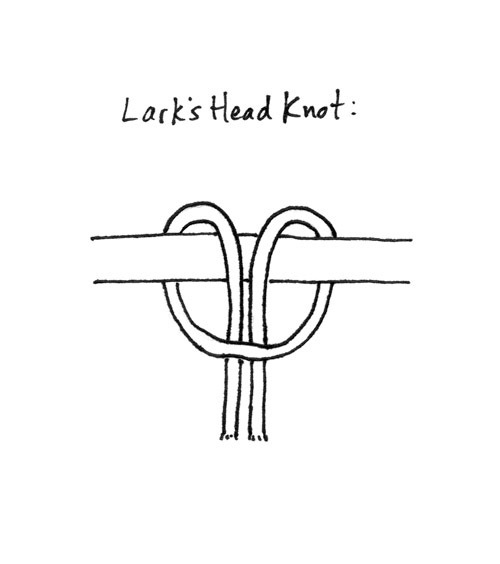 With Texsolv, you’ll make loops in the lamm-to-treadle cords and secure them with arrow pegs. Unfortunately, these are a lot harder to adjust than the snitch knots. I described this in the Texsolv post. The only thing I can say is that if your loom is like mine, yes your upper and lower lamms will probably want to run into each other, and possibly the shafts and the upper lamms. (The treadles and the lower lamms haven’t been a difficulty for me.) Joanne Hall talks about how to correct for this at the end of her book, Tying Up the Countermarch Loom. The only problem is that with a Bergman (the ones like mine at least) there simply isn’t much margin for correction, because it is short in the castle. If you’re weaving a pattern that allows your upper and lower lamms to shuffle between each other a little without sticking, I don’t think there’s anything wrong with that. But if you have to reach out and unstick them with every 4th change of shed–as I did with my first big project–Something Is Very Wrong. You shouldn’t have to lose your rhythm, monkeying with your lamms! Treadling smoothly helps. You will figure out what works best as you start weaving. Your sheds will never be spacious, but that’s okay if you can get them clear. You will probably want to use old-fashioned Swedish shuttles with paper quills, the low profile kind. That was the only kind my loom’s original owner, Mrs. S-G used, and they were Margaret Bergman’s regular type of shuttle as well. 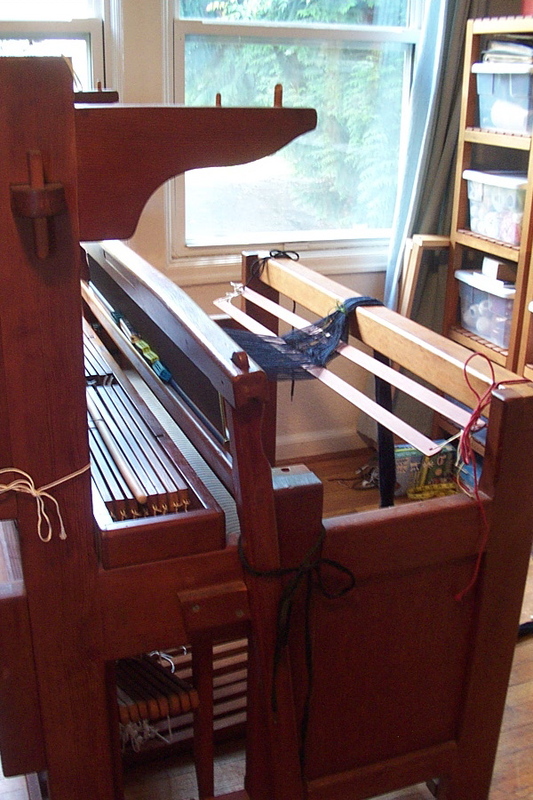 Actually, I adore all the skinny old shuttles that came to me with my loom! My very favorites are a pair of beautifully weighted maple ones that I’m sure were Mrs. S-G’s favorites too, since they are more worn than all the others, and she took the trouble to write her initials on them. My treasures! They are only a little over 3/4″ tall. I am really surprised how many interesting weavers and proto-weavers have been showing up in the comments section looking for information, especially after my Warping My Bergman With Mrs. S-G post of a few weeks ago. It looks like I should be running an informational website rather than keeping a weblog! I want to make a disclaimer, though. I am not any kind of a Bergman guru; just someone who owns and loves a Bergman loom and has figured out (more or less) how to make it work. I’m not keyed in to the off-line Bergman weaver underground (and I do hope there is one! Drop by and reassure me if you’re a member!) because I don’t live in the lower Puget Sound area. 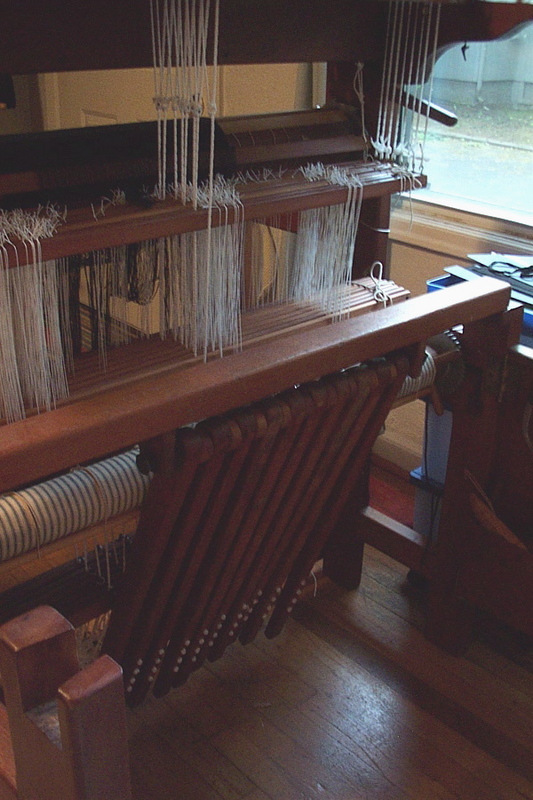 Seattle, especially, has a large and active weaving guild. These looms are built to last. If a local breed of loom is readily available generally in good shape, I think there will always be some local weavers weaving on it. Perhaps you can sniff them out! It’s difficult to respond to your questions in the comments section, since I don’t know where you’re coming from. I want to ask: Do you know how a countermarche mechanism works? Is this your first loom? Have you ever woven before? Have you ever woven on a countermarche loom? 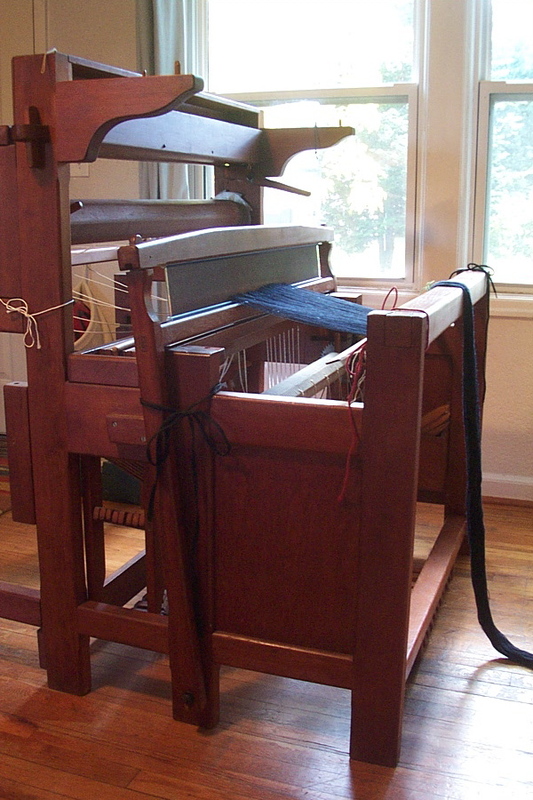 Have you ever done the tie-up on a countermarche loom from scratch? I think maybe some of the confusion (and intimidation) around setting up a Bergman loom is a result of the general mystification of countermarche mechanics among weavers. I wish I had diagrams of my loom so I could show you exactly what’s goes on with a Bergman, because Deborah in the UK is right, photos are not enough. There are a few differences between a Bergman and a normal Scandinavian countermarche. But those will mostly just affect the size of your sheds and how smoothly your weaving goes. Worry about them later. Or rather, don’t worry!–check back at my blog because I plan to talk about these things over time. The first thing is simply to learn the basics of how your loom works, set it up, and start weaving. For this, the similarities between a Bergman and a Glimåkra are more important than the differences. The Glimåkra is the behemoth of countermarches and the make for which there is the most information available in English. Don’t wade through the whole morass of unrelated weaving books at the public library (though that’s fun too), trying to find out how to weave on your obscure 70-year-old countermarche! You’ll just get bogged down. Do some pointed research. 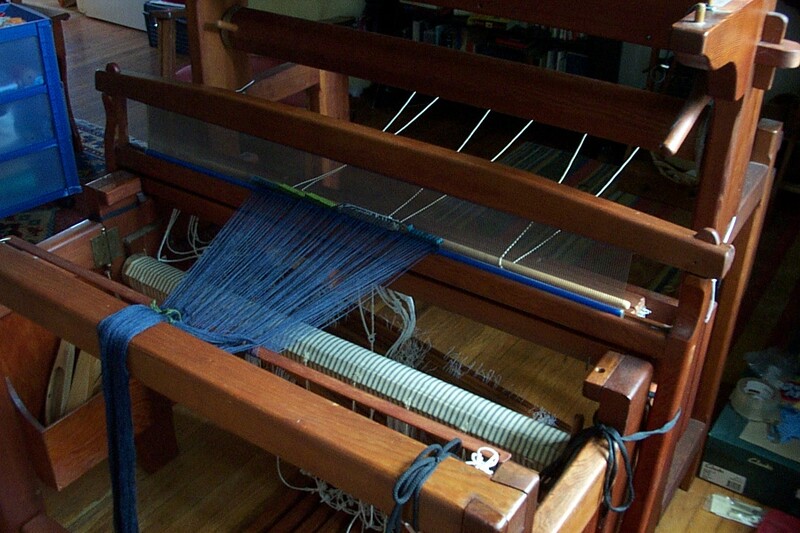 Your first stop should be Joanne Hall’s website: Elkhorn Mountain Weaving, http://www.glimakrausa.com/. This Glimåkra dealer has written the definitive English instruction book for tying up a countermarche. Her diagrams are extremely clear. She has scanned some pages from her book onto her website, but the scans are fuzzy. I can’t stress enough how glad you will be if you buy the book rather than trying to make do with what’s online. Yes, it’s only 34 pages long, it’s spiral-bound, it’s expensive. But it has a glossary, a sleying chart, knots, and invaluable sections on how to how to evaluate and adjust for tie-up related problems that may occur when you are weaving. And you can take it with you under the loom. I find myself opening it up pretty much every time I warp. Vävstuga, http://vavstuga.com/, is another great resource. Vävstuga also carries Joanne Hall’s book mentioned above. Becky Ashenden, the co-owner, is the North American maven of Swedish weaving. She carries a lot of Swedish weaving classics, all for sale in the books section. One of these has been looking particularly interesting to me, because it seems to be a complete survey of how to weave on a countermarche for beginners: The Swedish Weaving Book: project planning, loom dressing, and finishing. I can’t vouch for it since I haven’t read it, but Ms. Ashenden thought it was valuable enough to translate it from the Swedish and publish it herself. It’s exactly the sort of book I wish I’d had at hand when I started puzzling out my loom. Finally, I’d like to mention a bugaboo of most new Bergman owners: those scary wires. They make your loom look older and creakier than it is. Probably they are bent and sticking out in all directions. Those wires are just the Bergman equivalent of the cords that suspend the lower lamms from the inner ends of the jacks, found on all countermarches. 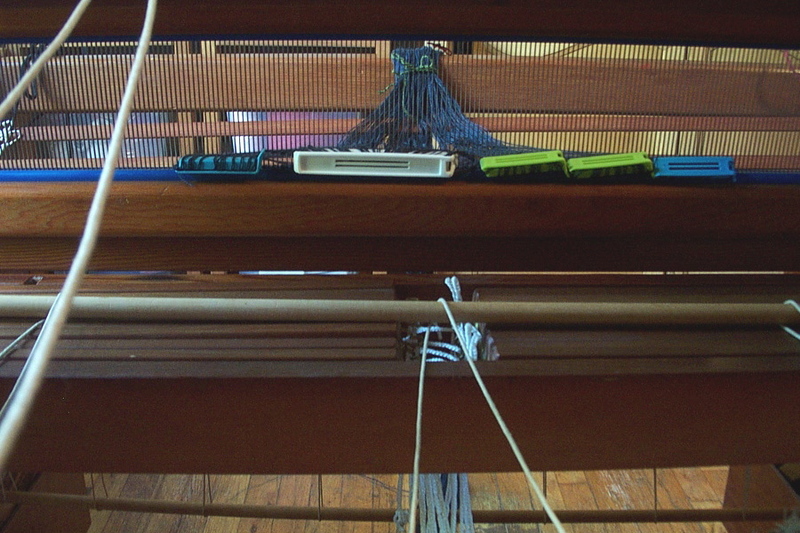 Margaret Bergman designed her loom with wires instead of cords to cut down on space between the shafts. If the wires are rusty, take them off the loom clean them up with some Naval Jelly. Run them through your hands to straighten them out as much as you can. When you your loom is tied-up and ready to weave, the weight of the lower lamms and treadles will straighten them out the rest of the way. It’s always delightful to hear from a Bergman beginner! Keep stopping by! I wish I could have met Mrs. S-G, the original owner of my loom. She was a fine weaver, a good designer, and extremely productive. At some point in her life she became acquainted with Margaret Bergman and jumped into weaving with both feet. Imagine you are a homemaker in the 1930’s (it’s still the Depression, remember). Imagine what a self-defined person you would have to be to end up raising sheep, owning half a dozen looms or more, and running a popular weaving school within the next two decades. Further, imagine the difficulties that you might face as a middle-aged family woman in the 1950’s who has decided to register and commute into the city for a textile class at the state university–perhaps having never taken a college course in your life! I have only a few of Mrs. S-G’s papers and class materials, but they are enough to show me what an extraordinary person she was. I get the impression she saw herself as an apostle of Margaret Bergman, carrying the Great Weaver’s teachings to the opposite outlying area of the region. Everything I have read about Margaret Bergman suggests she was a extremely inspirational and generous woman. Her students held her in awe. Among the books, magazines, and papers that came to me with Mrs. S-G’s loom were some mimeographed copies of her warping hand-out. She wrote it to help her students remember the way she taught them to warp in class, so it is hard to puzzle out on its own. I was only able to understand the hand-out after putting it together with a typescript of instructions the Bergmans provided with their looms in 1969. Unfortunately, these instructions didn’t come to me with my loom. I didn’t even know they existed until I was deep in tie-up-adjustment perplexity! I was so shy of “bothering” experienced weavers with my obscure problems, that I was pretty desperate by the time I contacted the same weaving guild Mrs. Bergman helped form in 1938. It was a slim chance, but I hoped someone living in the area of the Bergman workshop might still be weaving on a Bergman loom, or at least be able to point me to a museum or archive with Bergman resources. This was the first time I saw how small the weaving world is. The guild member who received my email happened to be related to the Bergman family herself. She was lovely. It took her only a day to provide the typescript! I can’t say the typescript of, “Getting Acquainted With Your Bergman Loom,” and “Warping Your Bergman Loom” made everything clear. It bears the mark of a weaver who has explained a particular thing so many times that she’s developed her own short-hand terminology for addressing beginners. To my ear, it also seems to be written by someone for whom English was a second language. (I know a bit of Swedish and I can hear echoes of it in the rhythm and syntax, if I’m not imagining things.) Like Mrs. S-G’s warping instructions, the Bergman directions really need to be accompanied by illustrations–or by the demonstrations of the teacher herself! My point in all this? Well, mainly that what you are about to see is my implementation (with a few extra tips) of Mrs. S-G’s method of warping a Bergman loom, but also of her teacher’s, Margaret Bergman’s. 1. Wind your warp from 2 or more cones/spools at once. You only need to make a cross at one end of the warp, but I am paranoid (you will see why in a few more steps) so I make crosses at both ends. 2. Put a lease stick into each each side of your cross, and tie the lease sticks together at the ends with about 2” of space between them. 3. Pick up loops of warp and pre-sley your reed with the grouped warp threads, working out how many dents to skip according to the number of cones/spools you were winding from. (This calculation always sounds a lot more complicated when it’s written down, so I’m not going to try to explain it. A picture in a good weaving book is worth a thousand words in this case). My husband points out that “pre-sleying” makes it sound as if you are only going to have to sley your reed once, and you are getting it over with first thing. Sadly, no. Pre-sleying is when you use your reed as a raddle. I have found I like to do this on a chair with arms, over my lap. 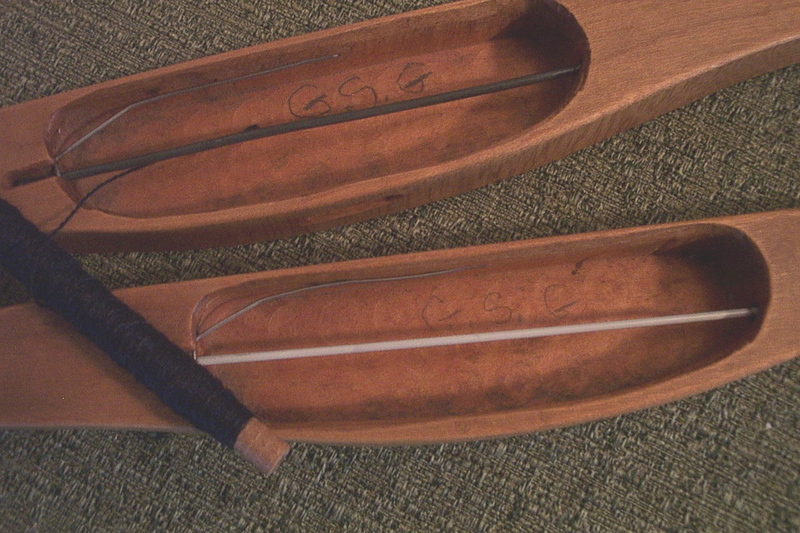 Traditionally the reed is propped up on edge using reedholders, on a table. Two pairs of steel office-supply-store bookends will also (sort of) do the job. Thread a stick through the loops of warp as you bring them through the reed, so they don’t pull back out again. Here I’m using using IKEA bag clips instead. Much easier to manage. 4. Next you’ll prepare the loom. Take your beater off the loom. Lift your treadle assembly out of its peg-holes and put it aside on the floor somewhere. Take off your breast beam and put it aside, too. Lift the cloth beam to its upper position in the angled groves (first removing the cotter pins, if they are securing it). Push the L-shaped wires clear through the holes in the front of the jack box to secure all the jacks. 5. Now for some Bergman magic: Lift your whole jack box down from the top of the castle and set it in the recessed area designed to support it at thigh level. 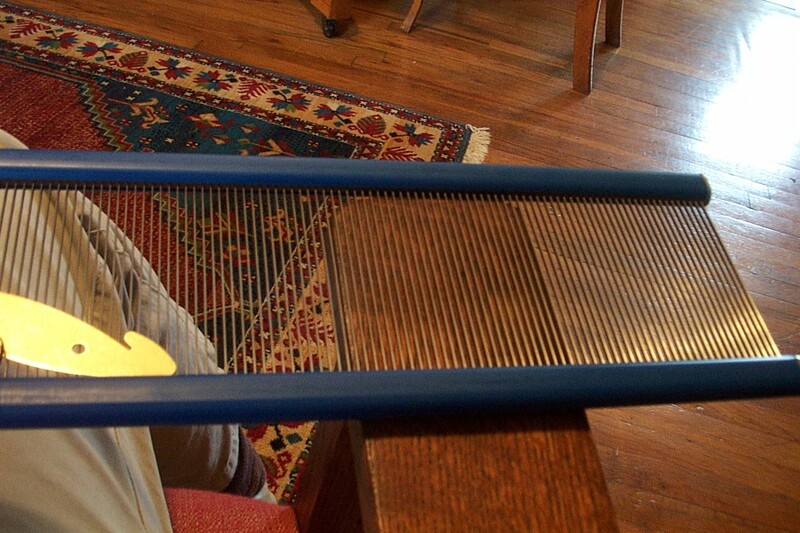 If your shafts/ heddle sticks are currently suspended from the jacks at this step, you will first use heavy twine or shoelaces to tie them together in a bundle, top and bottom, on each side, and let them come along for the ride (the wires that will attach the inner jacks to the lower lamms can come too). 6. Put the beater back on the loom. Tie the uprights of the beater loosely to the uprights of the loom; leave enough slack that when you pull the beater back toward you, it is cradled in position a few inches past the vertical: That is, it is leaning toward the front of the loom. 7. Put your pre-sleyed reed in the beater and center it. Replace your breast beam on the loom. Flop your chained warp over the top of the breast beam. Work your lease sticks back from the reed and tie the nearest stick of the pair very loosely to your warp beam on either side. When everything has been done in the previous steps, your loom will look like this (with the exception of my beater, which is leaning the wrong way, and the white cord I keep tied to my castle, which isn’t holding anything at the moment). 8. Now, if you have have two back beams like me, make sure you are using the one in the top position (the other should be stored out of the way). Unwind the warp beam rod from the warp beam. The lashings that hold this to the warp beam should be reeling out from the underside of the warp beam. Take the rod and lacings over the back beam. From the underside of the back beam, bring them forward to the reed. Here is how this will look from the inside-back of the loom. I have a piece of black elastic securing the lever of my warp beam ratchet to the nearest corbel. That way the ratchet doesn’t lose contact with the pawls during the following steps. 9. The object is to get all those loops you pre-sleyed through the reed spread out on the warp beam rod. Likely, you will have to free the rod from the lashings and let them dangle off the back beam. On my warp beam rod, I have marked the three places my lashings naturally rest with a pencil, so I know where they’re supposed to go when I thread them on again. Place the warp beam rod through the loops the IKEA bag clips (or stick) are holding, remove the IKEA clips (or stick), and replace the lashings, making sure everything is centered and square. Wind the warp beam a little to get some tension on the lacing, bringing the warp beam rod level with the back beam. Keep winding until all the lacing has been taken up, and the warp reaches the warp beam. Now it’s time to transfer the cross. Now transfer the lease sticks and the cross to the back side of the reed. To do this, use a third stick as a substitute for the stick that is to be removed . . . Untie the lease sticks and lift the one nearest to the reed, inserting the third stick in the space where this lease stick is. The lease stick should then be removed and the spare stick raised close to the reed to get a shed behind the reed to put the lease stick into. Insert the lease stick in this shed and remove the spare stick. Raise the second lease stick and insert the spare before removing it. Raise the spare stick (which is in front of the reed) and insert the lease stick behind the reed in the same shed. Remove the spare, tie the lease sticks together again. . .
11. With a piece of string at each corner, tie the paired lease sticks to the loom, so they can rest slightly hammocked in the space between the castle and the back beam. 12. While you wind your warp onto your warp beam, you will stand to the side of the loom, one hand on the warp beam, one hand holding the warp at tension over the center of breast beam. Surprisingly, this works! I’m not sure how it’s done with a wide, multi-chain warp, but it was fine for this 13” wide warp for wool scarves. Use paper, or put in beaming sticks to separate the layers of warp on the warp beam as you go. They’re easy to grab if you keep them in the storage box at the top of the loom. The fact that your beater is inclined a little toward the warp beam will help you catch tangles. If it pulls toward the castle, you know something is impeding the smooth flow of the warp through the reed. 13. When the loops at the final end of the warp approach your reed, cut them and let the ends pull through. 15. Lift the jack box back up to the top of the castle. 16. Untie your bundled shafts (or put them on, if they were detached), arrange your heddles on your heddle sticks, and sit inside the front of the loom to thread. The bench will fit inside the loom, but you will probably prefer to sit on something lower. Adjust the height of the shafts and the hanging lease sticks to suit you. With my Texsolv tie up, I like to hook the shafts from the button-holes of the chain cord in ascending height, front to back, which makes it easy to keep track of which shaft is which. Go ahead and fetch your treadles back to the loom. Let the treadle assembly rest in in its storage position right in front of the lowered jack box, pegs in holes (this is shown in the second to last photo). 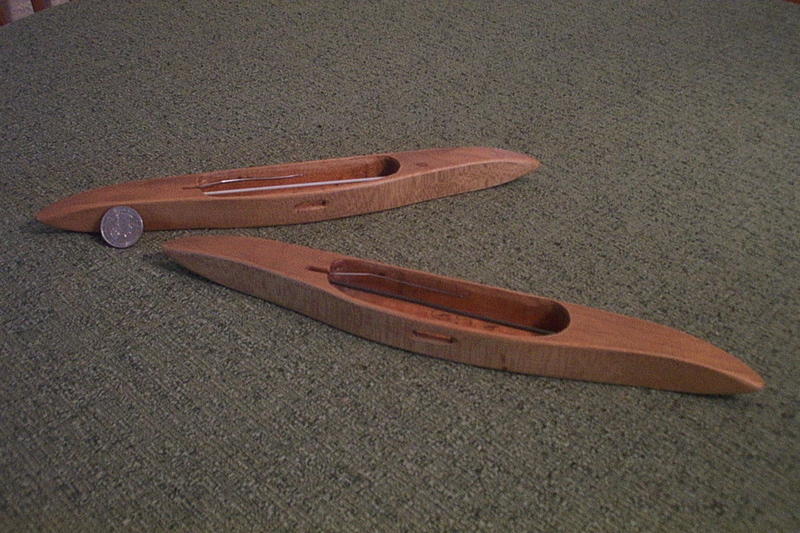 The beam has rounded edges and makes a good surface to rest your forearms on while threading. 18. Bring your beater back to the loom. Don’t put it on the pivot bolt, put it on the floor just in front of the bolt and tie it to the uprights on either side. No slack, this time. 19. Sley the reed. You will find it is at a good height for this with the beater resting on the floor. 20. Let the cloth beam down to its lowest position. Insert the cotter pins (dangling from strings nearby) into the hidden holes to secure it there. 21. Put the beater up on the pivot bolt. Make sure your washers are in position to keep the bottoms of the beater-uprights from getting chewed by the head of the bolt. 22. Bring your apron and apron rod up around your breast beam from the underside and tie on your warp. 23. 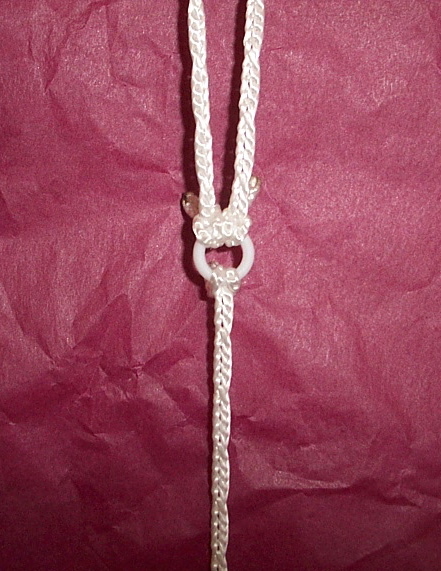 Once you have tied on, adjust the hanging-height of your shafts so that the warp passes directly through the center of the eyes of your heddles, or a very little higher. Now you are ready to tie up the lamms and treadles! A final note: If you want to preserve the tie-up you used for your last warp, as I did in this case, you can leave it in place and still follow the steps above. Just be sure to detach the lamms from the jacks and the shafts, and let them rest on the floor before you lower the jack box, or the jack box will be an unmanageable weight. Here is how it will look under the loom if you preserve your tie-up. You can still move your treadles up to the resting position for threading. I received some interesting responses when I posted about my problems winding warps with a warping mill and beaming them on. Jane, solo warper and owner of international looms, had raddle advice: slit paper towel tubes. And I was all like, duh! and yet, wow! One of the things I love about weaving is the way household objects start becoming weaving tools; Jane uses Home Depot painter’s paper to separate her warp. Cally offered hope of a well-trained husband. Katherine, a sectional warper, likewise recommends skilled beaming help. A bit later I found out Charleen has a vertical reel that works fine for her, now that she has learned to overcome her dizziness (though she does wind in quite small bouts). Dizziness is one thing that has never been a problem for me while warping! I wonder if this is a hidden advantage of the horizontal reels. The lengths of warp slide past your eyes up-and-down, rather than side-to-side like scenery whizzing past a moving car. I also got an out-of-the-blue comment from a seasoned Bergman Loom owner. One of my hopes for this blog has been that new Bergman owners will find it and be spared some of the trouble I had with mine in the beginning, but I was surprised to hear from a veteran. The lady was kind enough enough to measure her loom and send pictures. I asked her to do this because I have long suspected that my incurably narrow sheds are due to my loom being shorter in the castle and/or breast beam than later Bergman looms. There are not many pictures of Bergman looms on the internet–none full-figure–but I do have an magazine article from the 1940’s with a grainy photo of half a dozen set up in a library meeting room for a guild exposition. It was very hard to see, but I pored over it, and it seemed to me the castles were taller than mine. This lady’s loom was made in the 1970’s, shortly before the Bergmans closed up shop. Her castle and breast beam are nearly the same height as mine (in fact my breast beam is 1/2 inch taller), but my upper and lower lamms are set 2” closer together. Bingo! When the upper and lower banks of lamms on a countermarche are attached to the loom too close together, your sheds are small. Why? Well, when you push on the treadle, the rising lower lamms and the falling upper lamms quickly crash into each other. At that point, you can’t push the treadle any farther, so that’s as big as your shed gets. Ditto the sinking shafts and the rising upper lamms: crash! The best you can do is to adjust the cord lengths for all the moving parts for maximum non-crashing movement. This is why Glimåkra looms are so hugely tall (aside from needing somewhere to hang the beater). The more vertical space in which your shafts and lamms and treadles have free play, the bigger your sheds can be.
. . . as I understand it after crawling around my loom for months, trying to maximize my sheds. Not that I have ever woven on a full size Scandinavian countermarche. I’ve just thought a whole lot about loom design. There is no better education in simple mechanics than pinpointing the shortcomings of your own machine. 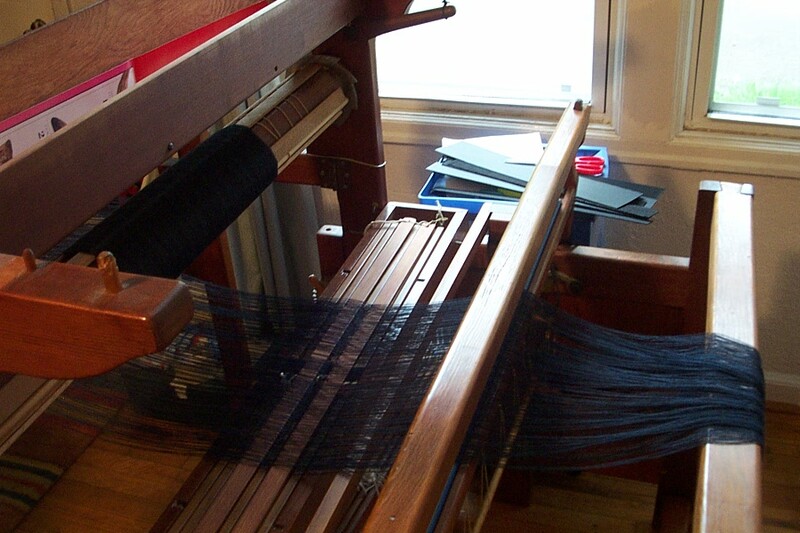 The Bergman loom was designed low and compact in order to be quite strong, yet fold easily when warped. This has wonderful advantages. You don’t have to take it apart to get it through a doorway, just fold in the wings. But there are sacrifices you will make with a smaller loom. If the height of your countermarche loom affects the size of your sheds, the depth of the loom affects their quality. 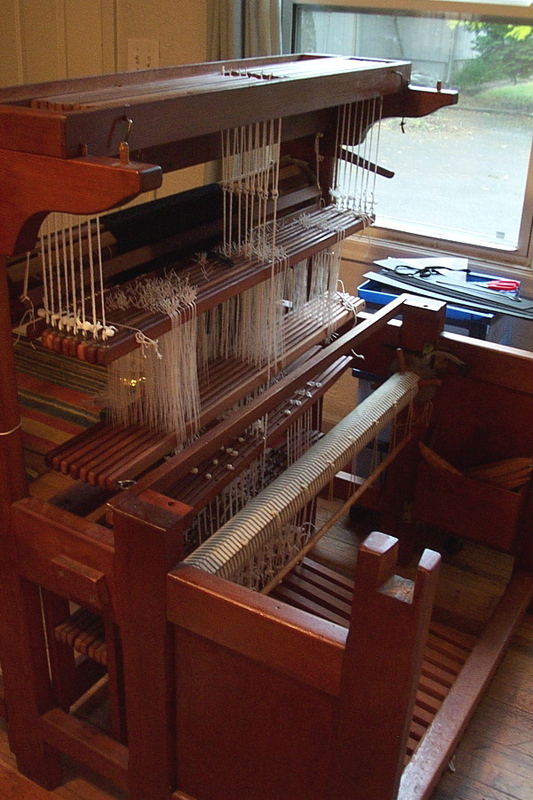 A Bergman loom may be decently deep for a countermarche, but not for a Scandinavian-style countermarche. 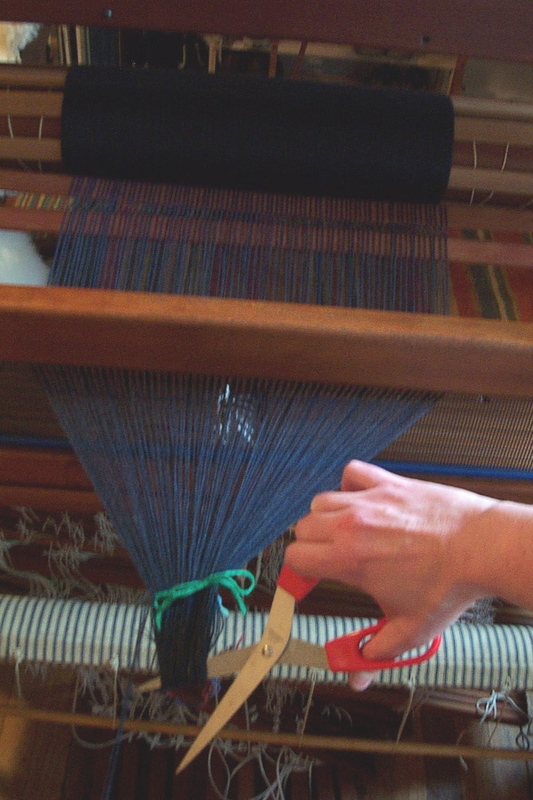 Deeper looms allow for more inches of stretched warp from back beam to breast beam. This means (how do I describe this; it’s all so visual!) more total elasticity, therefore less stress on your threads while weaving. For instance, pull on an 80” inch piece of string, then a 20” piece of string: there is more “give” in the 80” piece. Now picture each of these two pieces of string stretched across a brick and tacked to the floor at both ends. The 80” inch string approaches the floor from the top of the brick at a gently inclined angle, whereas the 20” string is very sharply inclined. On a short looms the sharp incline of the warp from the lowered shafts to the fell line contributes to bad sheds. This is because the thread angle produced by each separate lowered shaft will be quite different from its neighbor’s. The steep angle magnifies all the discrepancies. Your shuttle will try to sneak under the high threads when it’s supposed to glide over them. Here’s an old picture I borrowed for a good cause. Thank you, Ulla Cyrus. You can get good sheds with a Bergman (I’m taking this on good faith from Mrs. S-G), but it will take a lot of fiddling. My Texsolv tie-up is a problem in this department. A person can only fiddle with Texsolv so much, because it only allows adjustments in 1 cm increments. I would really appreciate being able make finer adjustments than that. I decided to make a fresh start with the Texsolv because my loom’s tie-up had been Frankensteined. The cords it came with were ancient, all lengths, several thicknesses–none of which fit through the holes in the lamms. I wrapped the ends with masking tape and worried them through for my first warp, but it was hellish. The rest of the cords were clearly on their last legs, er, strands. The heddles were so many sizes, I couldn’t even guess which size was correct. I think someone had simply grabbed a bunch of assorted heddles and cords belonging to various looms from what remained of Mrs. S-G’s weaving school supplies. 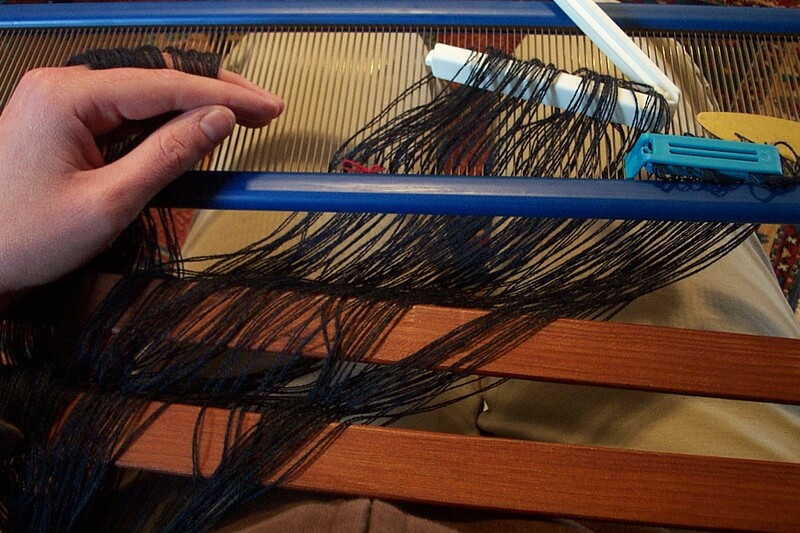 You wouldn’t think so, but restringing the loom with Texsolv was a huge job, as well as expensive. My advice? If you don’t have to go the Texolv route, don’t–at least not until you have woven 3 or 4 warps. Unfortunately Bergmans take less kindly to Texsolv cords than most looms. As well as the difficulty making fine adjustments, the usual benefits of Texsolv aren’t available to Bergman owners. Because there are only 6 holes in the treadles of an 8-shaft Bergman loom, you must must make old-fashioned treadle loops. This means no going-through-the-treadle-hole-anchoring-underneath. No cool Vävstuga knitting needle tie-up. Just a messy loop-through-a-loop secured with an arrow peg. Another inconvenience: the holes in Bergman lamms are small. Unless you take a drill to them (Please don’t! ), it will be a real pain to get a Texsolv cord through. 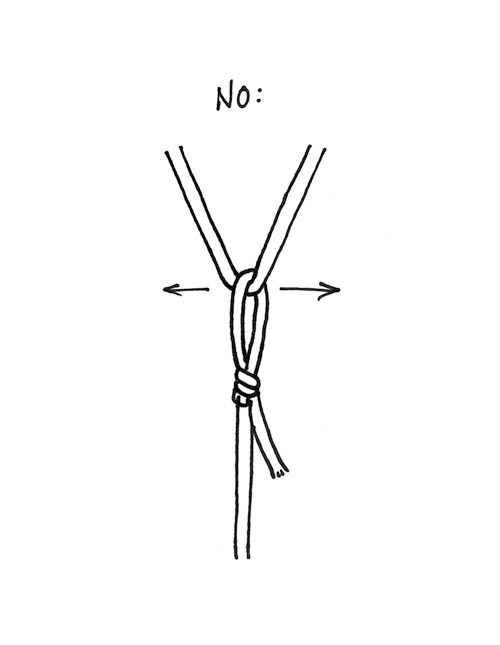 You will spend a lot of time with a candle, melting and shaping the ends of all 80 tie up cords to severe 1” points. 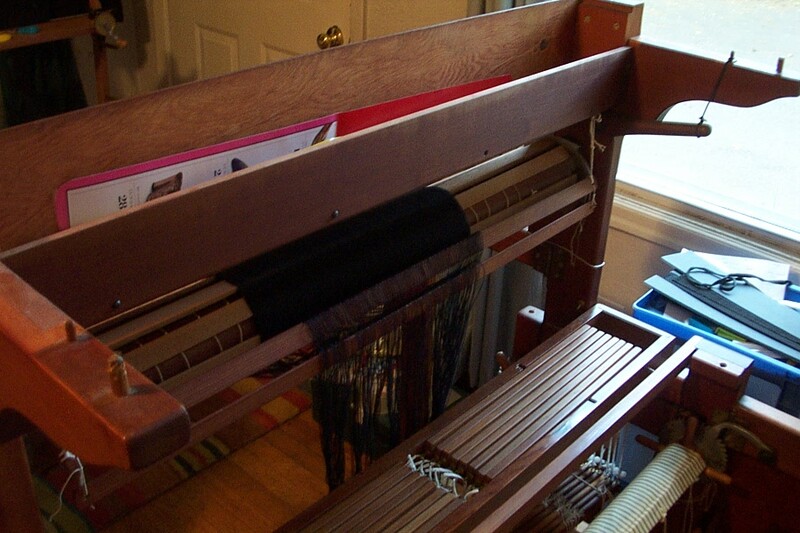 That said, my Texsolv tie-up is a big improvement over the one my loom came with. I even replaced the wires that went from the inner jacks to the lower lamms. 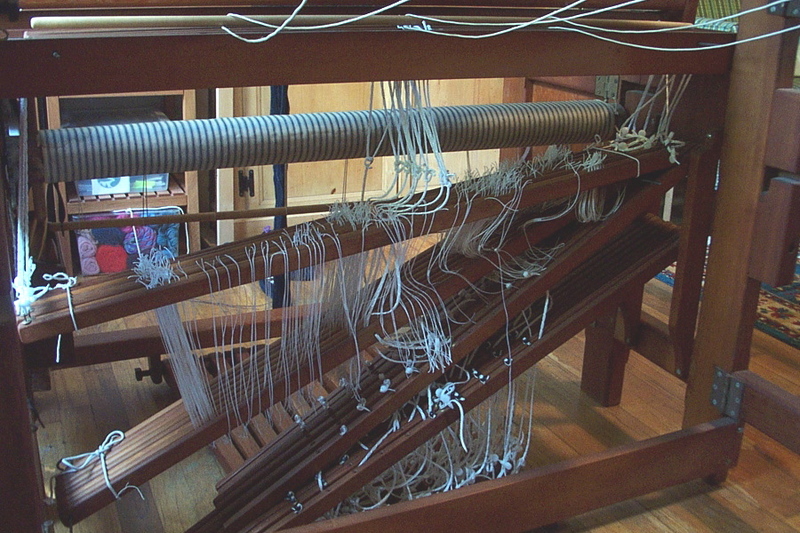 None of the several lengths of wire that came with the loom were the right length–more Frankensteining. Since Texsolv is slippery, this seems to work okay, although it adds a little bulk between the shafts. If I had it to do over again I might look harder for some linen tie-up cord. Did you know dense, non-stretchy cord is really hard to find? Some sources I consulted recommended linen drapery cord–the kind that goes around the pulleys on fancy fitted drapes, or that you use to string roman blinds. In the 21st century? Pff, doesn’t exist for normal mortals! Though I suppose a person could try asking a seamstress or an upholsterer who sews custom drapes. Pretty much all non-stretchy cord is synthetic now, and you really need the friction of a natural-fiber cord to make the treadle tie-up knots and Bergman twist-around-a-cuphook adjustments hold properly. I recently discovered that Earth Guild carries seine twine. ** I bought some and it is very sturdy but not thick enough enough for the treadle tie-up. I wonder if there are any linen carpet warps heavy enough and highly twisted enough to work for that? I would still buy Texsolv heddles, though. The string heddles were a pleasure to thread, and easier on my eyes than shiny Texsolv, but really needed to be replaced. Personally, I knew I was not going to make a heddle block and tie 900 new string heddles, so Texsolv was just dandy! Let me wind up with a testament to the power of the Internet. While I was composing this I heard from a brand new weaver who just yesterday bought a lovely older Bergman like mine. It’s really exhilarating to have something to offer! I had been wondering if there is any point in talking countermarche shop at such length (Like dreams, eccentric looms are always most interesting to their owners. ), but now I think I will go ahead make this the first in a series of related posts, with excursions back to my current project and whatnot. A sort of Rough Guide to Bergman Weaverland. Maybe it will even entertain some armchair travelers. **Sorry, I meant to say Earth Guild carries hawser twine. 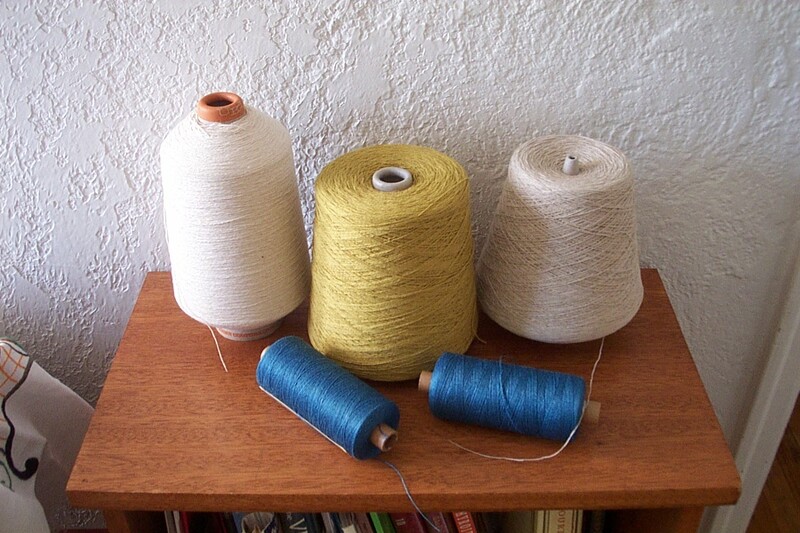 “Seine twine” was stuck in my head because the old books say to use linen seine twine for heddles. It seems to be a marine product. I see Camilla Valley Farm sells it in cotton and cotton/poly for tapestry and rug warps. It looks a little lighter-weight than my hawser twine.